The problem is tackled wuth two layers. Firstly the new Grammar Guided features provide a wide range of high quality low-level features. Secondly, the system is optimized to generate good quality location predictions, rather than pixel calssification. 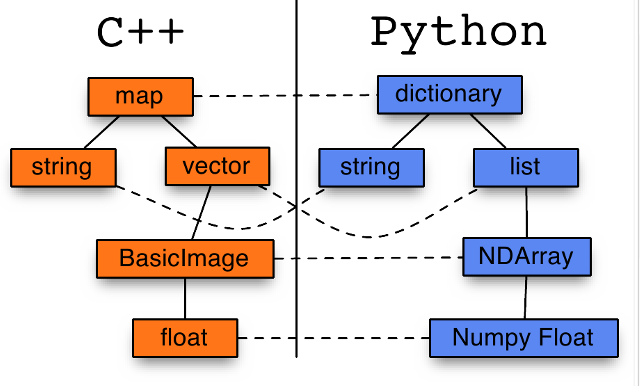 Generative grammars are used to dynamically build a wide range of high quality features. These features take the form of small image processing programs. The image shows the system diagram. The output of the system is a list of (x,y) pairs of object detections. These are used to create an ROC curve and the entire system is then optimized to maximuze the AROC (Area under ROC) score. Note that this requires very careful definition of what precisely a true/false positive/negative is in an unstructured problem. GGFE is written in Python and the machine learning parts are written in C++. Convert-XY provides a mechanism to safely, easily and efficiently move data between the two languages, while staying in the natural system of types in both languages.